I’ve mentioned my love of soba noodles on the blog before, right? I’m sure I have. They’re one of my favorite ingredients to plan a meal around and I haven’t had them in quite a while, so last week at the grocery store I made sure to pick up a few packages of them. I’ve made quite a few soba recipes, but I think last night’s dinner was a new one, though I can’t take credit for it. I made this recipe from Shape magazine. I thought it was very light and refreshing, not to mention super simple to make. Brent was a big fan of this meal as well. He just asked me if I was blogging (I guess it’s a rarity these days) about “that soba noodle thing.” I told him yes and he replied “oh yeah, that was blog-worthy.” So I would definitely classify this as a make again recipe. We’ve got 2 showings of the house tomorrow, so dinner will be coming from the freezer. I think it’ll be some tortellini casserole. Not sure there will be anymore “blog-worthy” meals this week. For your mid-week viewing pleasure, here’s a photo of Larry with the pillow we gave him. He doesn’t know if he’s allowed to lay on it, so he lays behind and sort of under it. Posted in Uncategorized and tagged Larry, Soba. Bookmark the permalink. It was delicious – even if I could only chew with one side of my mouth. After finishing my exam (which went very well) in record time, I stopped at the store to grab some lemons and limes in preparation for a celebratory cocktail. I was feeling particularly dedicated though, so I did head to the gym for a cardio workout first. Now I am finally on the couch enjoy said celebratory cocktail: a margarita! My recipe for margaritas is super simple, maybe not authentic, and not too strong: 1 part each: lemon juice, lime juice, tequila, triple sec and simple syrup. I need your help! My work is having a potluck cookout on Friday and they would like me to bring a dessert. I’d like to make something bite-size or at least individually portioned, but I’m kind of cup-caked out, and I’m not sure cookies would be exciting enough. Any suggestions? Posted in Uncategorized and tagged cocktails, Soba, Tofu. Bookmark the permalink. Tonight’s dinner was a make ahead because I spend Wednesday nights at the NICU. It was a meal we ate all the time last summer and I loved it. However, this time… not so much. The problem stems from my irrational hatred of mayonnaise. Last summer I made this with soy mayo, Nayonnaise I think. The soy mayo is a bit runnier which I prefer. Tonight I made it with regular mayonnaise and it was just a giant clumpy mayonnaisy mess. Blech. Because we ate it for dinner, I bulked it up a bit more with a red bell pepper. I’ll make it again, but with the soy mayo. I just hate the texture of real mayonnaise. The night has improved since then though. Now I’m watching Lost while drinking a Borsao blend of 75% Garnacha and Tempranillo, which is delicious and cost like $9. I also had Brent slice up a bit of Manchego to nibble on alongside. It’s a pretty great way to end the night. The work week is more than half done! Posted in Uncategorized and tagged Soba, Wine. Bookmark the permalink. Dinner tonight was quick. 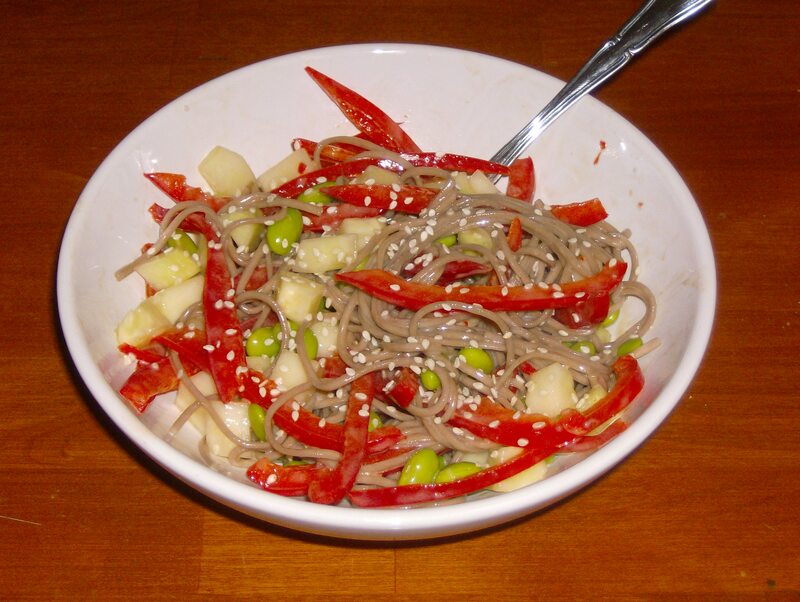 I found a recipe for Sesame Soba Noodle Salad in the latest issue of Women’s Health that I thought sounded good. It had quite a few things I love, like soba noodles, edamame, and miso, but they were definitely put with some other interesting ingredients. I made a few minor modifications: added red bell pepper because we bought a ton of them, used chili paste instead of crushed red pepper, and my soy wasn’t low sodium so I just left out the additional salt. The Verdict: it’s pretty tasty; definitely different. We’ve had a lot of soba, edamame type dishes, but the mint and the orange created a definite twist. We may make it again. It was really quick and easy to make. Now I’m ready to settle in on the couch and watch the CHICAGO CUBS beat the Dodgers! 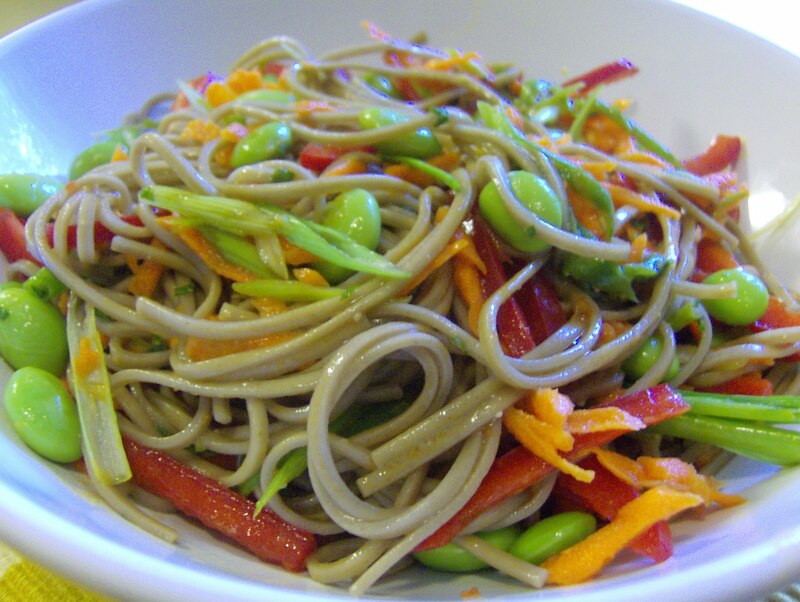 Posted in Uncategorized and tagged Soba. Bookmark the permalink. I really need to work on my titles. Moving on to the food… I’m trying to post all my dinners, at least those that I make, because I thought it might encourage me to try new things and create more of my own recipes, and sometimes I just think the food looks pretty. We made the recipe above minus the sprouts, added a red bell pepper, increased the cucumber, used soy mayonnaise instead of regular. I love soba noodles. Delicious. No baking tonight because I’m exhausted. I haven’t been sleeping well at all, so I’m thinking I will be cutting out caffeine for a while and see if that helps (although I don’t drink too much of it now). I’m formulating a recipe for some cookies that will either be amazing… or nothing too impressive. You’ll probably see those tomorrow, and I’m going home to Chicago this coming weekend, and will be baking A TON of stuff to bring home with me, to give to friends and family. Stay tuned! 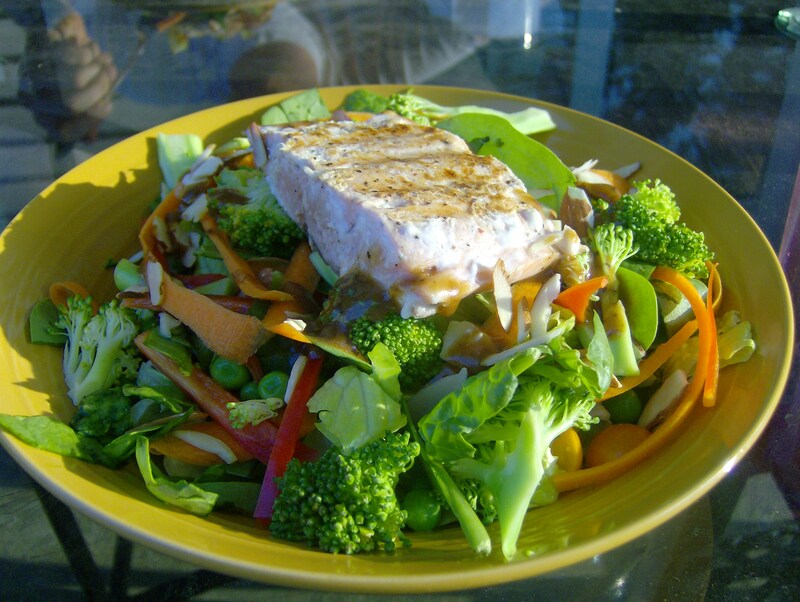 Posted in Uncategorized and tagged Salad, Salmon, Soba. Bookmark the permalink.